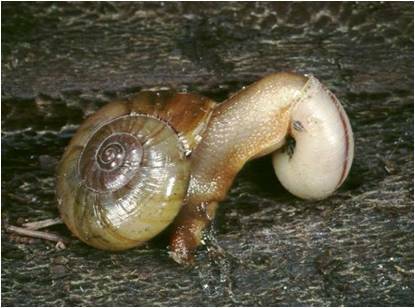 Most native snail species are detritivores – i.e., they eat decaying plant or leaf-litter material and fungi. However, the Glossy Turban Carnivorous Snail (Terrycarlessia turbinata) belongs to a family (Rhytididae) whose members prey on invertebrates such as earthworms and also on other snails. Some are even cannabalistic – devouring smaller individuals of their own species. Their radula (toothed tongue- ribbon) has sharp, pointed teeth designed to tear flesh rather than rasp plant or detrital matter. The shell of this species can reach 36 mm in diameter and, as the name suggests, is glossy and turban-like in shape. It is sculptured with radial ribs and fine spiral lines. The animal colour is orange-brown with a cream stripe on the back of its neck. This predator lives under logs and in deep litter. It ranges from the Barrington Tops in New South Wales to about Nambour in south-eastern Queensland.